In addition to regular probability, we often want to figure out how probability is affected by observing some event. For example, the NFL season is rife with possibilities. From the beginning of each season, fans start trying to figure out how likely it is that their favorite team will make the playoffs. After every game the team plays, these probabilities change based on whether they won or lost. This post won't speak to how these probabilities are updated. That's the subject for a future post on Bayesian statistics. What we will explore is the concept of conditional probability, which is the probability of seeing some event knowing that some other event has actually occurred. Inveterate bridge players like my dad would keep track of cards as they got exposed in the pile, for that (and the bids) provided information about the likelihoods of what hand each player had. Such card counting and conditional probabilities (what's the likelihood of each hand, given what I have seen) is one of the (frowned upon) strategies for trying to beat the casinos in blackjack and poker (see the movie 21 for a Hollywood version of real-life card counting in casinos). When we go to the doctor to test for a disease (say tuberculosis or HIV or even, more commonly, strep throat and flu), we get a yes or no answer. However, no test is perfect. A positive test still means we might not have the disease, and testing negative might mean we have it, though hopefully with very little likelihood. For us, the important thing to know is, if we tested positive (an observed event), what is the chance that we truly have the disease (an unobserved event). Weather forecasting is based on conditional probabilities. When the forecast says that there is a 30% chance of rain, that probability is based on all the information that the meteorologists know up until that point. It's not just a roll of the dice (though sometimes, it feels that way). The flu season is rapidly approaching. Each of us have some probability of getting the flu, which can be naively computed as the number of cases of flu last year divided by the number of people potentially exposed to the flu virus in that same year. Let's call this probability P(flu). If a person gets a flu vaccination, their chance of getting the flu should change. This would be denoted as P(flu|vaccine), and is read as "probability of getting the flu given you have been vaccinated." Because of the "been vaccinated" condition, this is a conditional probability. P(A and B) is often called the joint probability of A and B, and P(A) and P(B) are often called the marginal probabilities of A and B, respectively. The numerator is the probability that a person gets the vaccine and the flu; the denominator is the probability that a person gets the vaccine. Next, we will swap out the the different conditions (A B C D) with numbers so that we can calculate an answer! So this probability is the chance of getting the flu only among those who were vaccinated. We have normalized the probability of an event (getting the flu) to the conditioning event (getting vaccinated) rather than to the entire sample space. Challenge Question: According to the table above, what is the probability of getting the flu if you weren't vaccinated P(Flu | No Vaccine)? What is the probability of getting the flu P(flu) in general? There is another way of looking at conditional probability. If we don't know anything about event B, P(A) is the size of the light blue circle within the entire sample space (denoted by the rectangle). If we know that the conditioning event B has happened, the probability of the event A now becomes the ratio of the light blue section to the light and dark blue section. We can then make our sample space of interest the space where event B occurs. Statistically Independent Events We can compare the probability of an event (A) and how it changes if we know that another event (B) has happened. How does the chance of catching flu (A) change if you're vaccinated (B)? How does a football team's chance of going to the playoffs (A) change if the quarterback is injured (B)? In both these cases, we think those chances will change. But will the chance of the Pittsburgh Steelers beating New England Patriots (sacrilegious to some, I know) in the 4 pm game depend on the Seattle Seahawks beating the San Francisco 49ers (caveat: I'm from Seattle) during the same time? We think (and hope) not. When knowledge of one event does not change the probability of another event happening, the two events are called statistically independent. We see a lot of things that are independent in this sense. Successive tosses of a coin are independent, or so we believe. So are successive dice rolls and slot machine plays. This means that we can compute the probability of two independent events happening together by merely multiplying the individual probabilities. Caution: You'll often find probabilities of joint events like this computed as the product of the individual events. However, this is only true if the assumption of statistical independence is valid. Often times, it is not, and so you must be careful interpreting such computations. Let's do a little experiment in R. We'll toss two fair dice, just as we did in an earlier post, and see if the results of the two dice are independent. We first roll the dice 100,000 times, and then compute the joint distribution of the results of the rolls from the two dice. These results are very close. Note: R makes it very easy to do conditional probability evaluations. In R, you can restrict yourself to those observations of y when x=3 by specifying a Boolean condition as the index of the vector, as y[x==3]. We computed the first part earlier from prob_table. We see that prob_table and prob_table_indep are quite close, indicating that the rolls of the two dice are probably independent. One statistical test for testing independence of two frequency distributions (which means that for any two values of x and y, their joint probability is the product of the marginal probabilities) is the Chi-squared test. In R, this is implemented by the function chisq.test. We see that the p-value of this test is quite large, indicating that there is insufficient evidence to suggest that x and y are not independent. Challenge question: If two events cannot occur together (they are mutually exclusive) can they be independent? Understanding how conditional probabilities change as information is acquired is part of the central dogma of the Bayesian paradigm. That paradigm is based on Bayes' theorem, which is nothing but a theorem of conditional probabilities. This provides the mathematical framework for understanding how A affects B if we know something about how B affects A. In other words, how knowledge of B changes the probability of A is the same as how knowledge of A changes the probability of B, at least as a ratio. 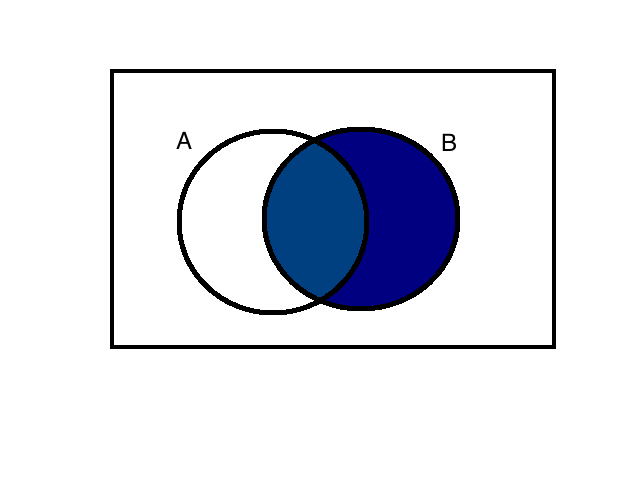 If A and B are independent, this ratio is 1. Suppose we have a test for the flu that is positive 90% of the time when tested on a flu patient (P(test + | flu) = 0.9), and is negative 95% of the time when tested on a healthy person (P(test - | no flu) = 0.95). We also know that the flu is affecting about 1% of the population (P(flu)=0.01). You go to the doctor and test positive. What is the chance that you truly have the flu? You can answer this question directly using Bayes' theorem, but we'll tackle this a bit differently. We'll create a hypothetical population of 100,000 people, and see if we can figure this out. In the above code we first simulate who has the flu, given on average 1% of the population gets the flu. We then find out whom among those without the flu would test positive, based on P(test - | no flu) =0.95. Recall that the when considering a conditioning event, the conditioning event is considered the sample space, and so all the laws of probability hold within that space. We do a similar computation for the people with flu. That is, the knowledge that we tested positive increased our chance of truly having the flu 15-fold! A constant issue in medicine is if we should address the absolute increase in risk (1% to 15%) or the relative risk (15-fold) when deciding on best clinical practice. Conditional probabilities and Bayes' theorem have many everyday applications such as determining the risk of our investments, what the weather will be like this weekend, and what our medical test results mean. These concepts are central to understanding the consequences of our actions and how relationships between entities can affect outcomes. With recent increases in the amount and availability of data, understanding these concepts become essential for making informed, data-driven decisions. In this post, we reviewed how to formally look at conditional probabilities, what rules they follow, how to use those rules along with Bayes' theorem to figure out the conditional probabilities of events, and even how to "flip" them. Below are some additional resources that you can use to continue to build on what we've covered here. Need help with statistical data analysis? With the increasing amount of data available, businesses can use conditional probabilities for key business decision making. Schedule a free consultation to find out how we can help!